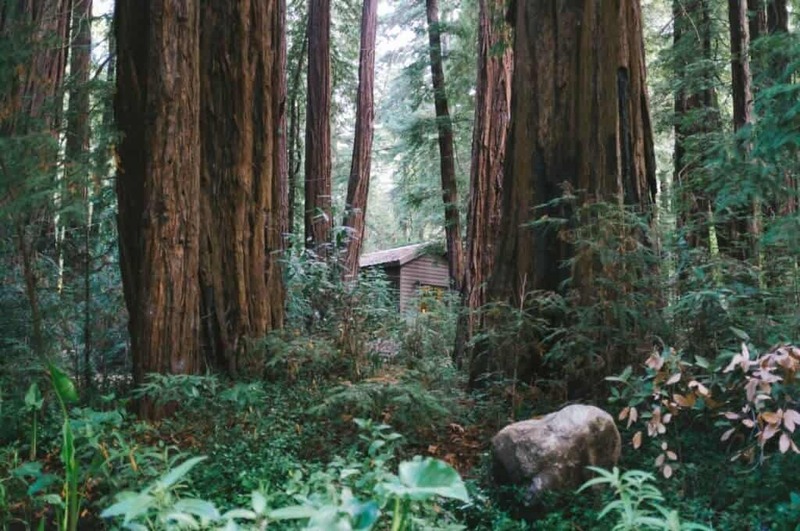 If you’re traveling north through California, your last chance to camp in a primeval forest of ancient redwoods is nine miles east of Crescent City in Jedediah Smith State Park. If you haven’t camped in the Redwoods before, it’s an experience not to be missed. I can’t imagine even making a trip to California without stopping to sleep and dream at least for one night amongst these silent giants of time and space. Many of these woody beings were planted by the winds, waters, and fires in the time before Christ. Their world offers a glimpse into the past that we visitors can scarcely believe still exists beyond our imaginations. We were lucky enough to spend several days at the Jedediah Smith campground in the Redwoods, and here’s what we discovered. 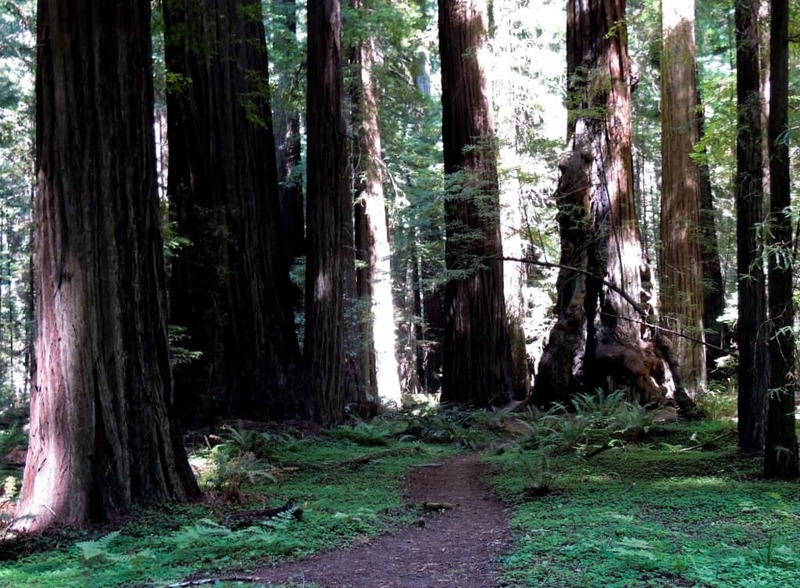 California’s famous redwoods are a rarity in our world indeed. Occurring naturally in a narrow strip of land between Monterey County, CA and the southernmost tip of Oregon, they are strangers to every other place on earth. They are also the tallest trees on the planet and have been known to reach the neck-craning height of 379 feet. You can never really see their tops if you’re standing in the forest. You can only imagine what the view is like from up there. 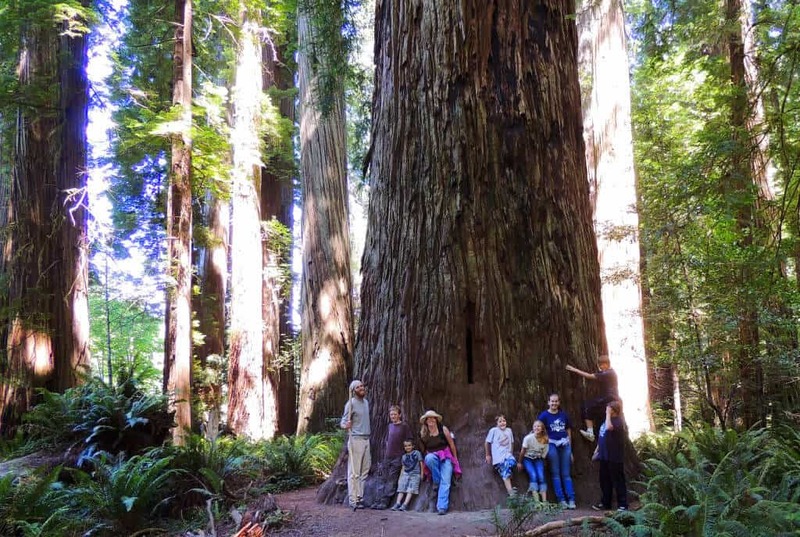 Home to seven percent of all the old-growth redwoods left in the world, Jedediah Smith Redwoods State Park lays claim to the earth’s biggest overall coastal redwood measuring 20 feet across its trunk and 340 feet to the top of its towering crown. It is also home to a section of California’s last major undammed river, the beautiful sparkling Smith River. Camping in Jedediah Smith State Park is a bit like spending a night on the Forest Moon of Endor and, if you’re a sci-fi dreamer, you might find yourself looking out for Ewoks hiding among the massive fallen trunks and head-high ferns that spout like green fountains from the loamy carpet beneath your feet. That’s because George Lucas filmed the Endor scenes from Return of the Jedi in the redwood forests around the Smith River, but you’re much more likely to spot a big banana slug smooshing its way along a wet stump near a campground spigot. The Jedediah Smith campsites are large, fairly private, and feature lots of under-story vegetation and fallen redwood trunks and stumps that my family enjoyed playing on and around. Keeping campsites “crumb clean” is strongly emphasized in the redwoods because of the close proximity of humans to predators like mountain lions and black bears. At night, it’s very dark and closed in under the deep canopy of the redwoods so listen for the sounds of spotted owls, coyotes and maybe even bobcats or mountain lions. Campsites at Jedediah Smith State Park include a picnic table, fire pit, and bear box, and ample room for your tent or RV. A few of the sites have direct access to the beautiful Smith River, but even the ones that don’t have access to the River Beach Trail, which takes you right to the river. During the summer months, reservations are strongly recommended, and sites definitely fill up. From October to April, the Jedediah Smith Campground is first come, first served. You don’t need to pitch a tent to enjoy the beauty of the redwoods in Jedediah Smith Redwoods State Park. Four cabins are available to rent for $80 per night (2019 rates). Cabins are ADA accessible and are located within the Jedediah Smith Campground. Jedediah Smith cabins have electricity – heaters and lights, but no kitchen or bathroom. Maximum occupancy is 6 people. Each cabin has 2 bunk beds, each with a twin over a double bed. Guests should bring their own sleeping bag or bedding. There is space for a small tent outside to accommodate an additional 2 people maximum. No Smoking, cooking or open flames inside the cabins. Cabins each have an outdoor Barbecue, fire pit, bear box, and picnic table. 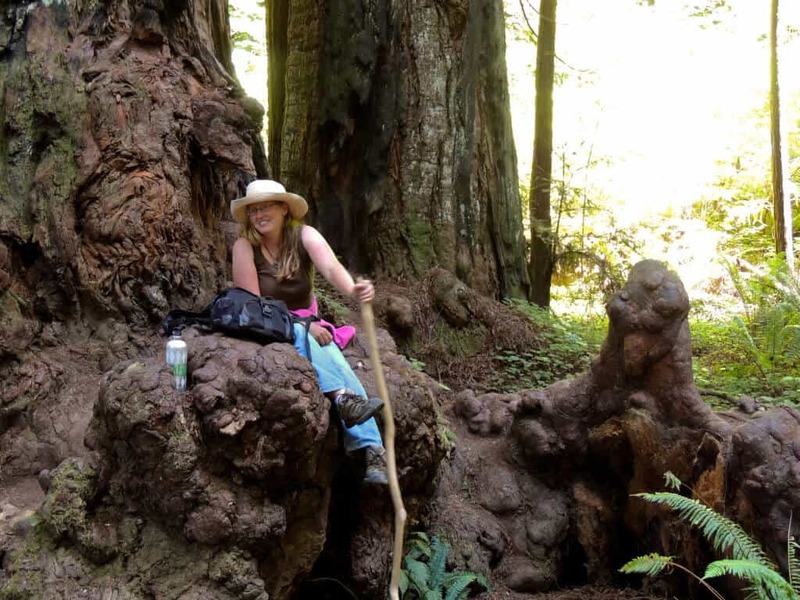 Walking and hiking is another great way to explore the Jedediah Redwoods. 20 miles of hiking trails give visitors lots of chances to easily experience the grace and magic of this special forest. Silent cathedral spires of redwoods mingle with old-growth douglas fir, Sitka spruce, evergreen tanoak, Pacific Madrone, bigleaf maple, California laurel, and red alder. Trails in Jedediah Smith State Park are well-marked, fairly smooth and mostly easy for legs both young and old. The understory of the redwood forest is very open and you’ll be able to see a surprising distance along the ground. Be sure to make frequent stops to daydream nestled in the roots of these age-old wonders. You may not be able to climb them but do enjoy their company. Redwoods are surprisingly accommodating. The ground is loamy and soft, the trees seem to be always listening, and sounds melt away into the distant trees or frequent fog that help provide the moisture necessary to the redwoods’ survival. Long corpuscular rays of sunlight filter through the redwood canopy, illuminating verdant green mosses and sword ferns, and pastel flowers of azaleas and California rhododendron. Some evenings the fog rolls in from the sea, filling the river valley and spilling out into the forest until all is enveloped in hushed tones. In the morning, the fog leaves the same way–floating like a ghost out of the forest, down the banks of the river and finally back down to the sea. Be mindful of this magical fog if you’re hiking close to dawn or dusk. Park rangers will also tell you to talk, whistle, and sing so that nearby predators know where you are and stay out of your way. Snaking its way through this ancient forest are the crystalline waters of California’s last big wild, free-flowing river-the Smith River, also known by the name Tolowa. No dams spoil its 25-mile journey from mountains and forests all the way to the Pacific Ocean. The Smith River is unforgettable for swimming, snorkeling, kayaking, canoeing, and fishing. Float along its meandering path to the sea and take breaks on the mammoth islands of rock in its deepest sections. Dive from these islands into breathtakingly clear water for a refreshing oasis you’ll never forget. You can see clear to the bottom even at its deepest points of over 12 feet within the park. Watch for record-breaking steelhead rainbow trout and chinook salmon as they dart from under rocks and flash reflections of sunlight through the clear water. Sun yourself at the little sandy beaches scattered along its edges as you watch the shadows from the redwoods changing the colors and moods of the forest. You might even catch a glimpse of the area’s wildlife while the river flows by — bald eagles, northern spotted owls, black bear, bobcat, mountain lions, beaver, river otters, black-tailed deer, elk and coyote all make their homes in this locale and frequent the sparkling waters of the Smith River. Respect the forest. This stand of ancient redwoods is listed on the United Nation’s list of World Heritage sites and has stood here for thousands of years. Follow Leave-no-Trace Principles and good campground etiquette. Keep your camp immaculately clean from food debris. You don’t want to attract animals to your campsite, especially while you’re out enjoying the forest and river. Northern California can be surprisingly cold at night and hot during the day. Bring your sweaters and cozy sleeping bags, but don’t forget your sandals, shorts, and swimsuits. Check out Jedediah’s Park ranger programs. The Rangers make these programs so much fun and the woodlore you bring back to the forest makes exploring even more dynamic. Meet your neighbors. This can be a busy campground with folks from all over. Forming bonds at a busy campground is a great way to make your camping feel less like “getting away from it all” and more like a shared human experience. Keep those lanterns handy. The redwoods can feel pretty dark and close at night. Take a river swim from the walking bridge down to the campground. Seeing the park from the river, even if you don’t have a kayak or canoe, is totally different than seeing it from the forest. This river has some beautiful deep areas and great rocks for jumping that you’ll only find if you swim it. Bring your water sandals if you’re a tenderfoot. Those colorful round river stones in the shallows can make for very sore feet. Camping in the Redwoods at Jedediah Smith State Park. While walking around the Jedediah Smith campground, be especially careful about coming into contact with poison oak. This fun-spoiler is easy to identify once you know it and many signs throughout the campground point directly to the plants. 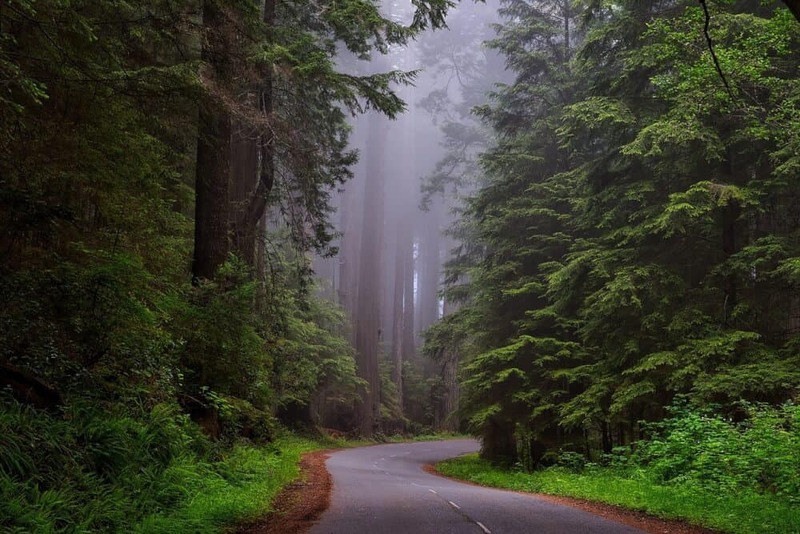 Ready to explore the redwoods of the California Coast? Jedediah Smith Redwoods State Park is one of our favorite California destinations. In fact, just writing about this incredible park is making me nostalgic for those friendly trees. Have you visited these giants of the Pacific? 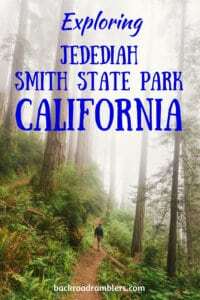 California State Parks – Visit the Jedediah Smith State Park website to learn more about camping, trails, and interpretive programs. 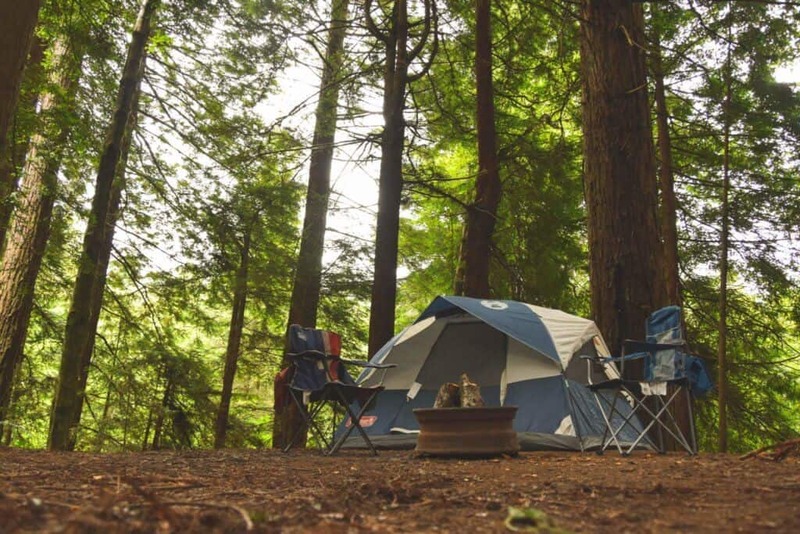 Lodging near Jedediah Smith Redwoods – While we wholeheartedly recommend camping, we also know it isn’t for everyone. You will find lots of lodging choices in nearby Crescent City, which is right on the Pacific Ocean. Visiting Crescent City – great little townThis is a with several awesome beaches, a lighthouse, and a fun aquarium. If you’re hanging out in the redwoods, don’t forget to stop. 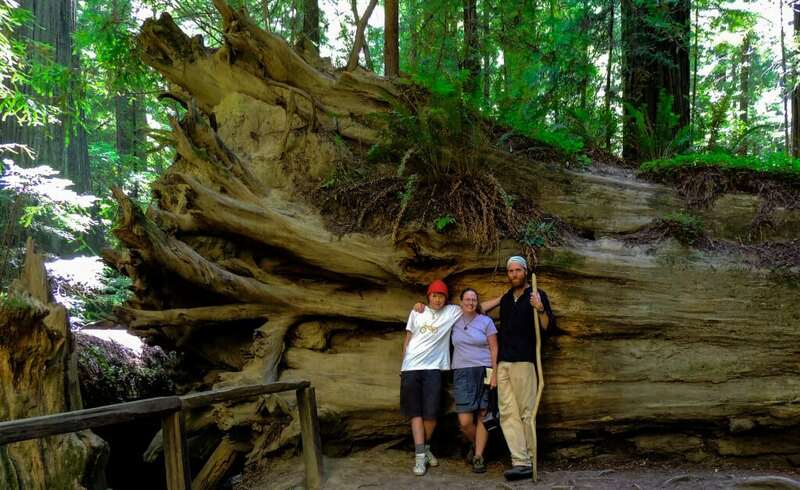 For more redwoods explorations, you can read about a family trip to Muir Woods by Learning Escapes. These trees are being damaged by people climbing around on their roots. Nestling amongst the roots is dangerous to these magnificent one of a kind Giants. Respect them. You are right! Unfortunately, I did not think of this at the time. It was a careless move! Thank you for bringing it to my attention. We try and promote sustainability and Leave No Trace practices whenever we travel and we hope others do the same. I think you meant to warn about contact with poison oak, not poison hemlock. Hemlock is fatal to consume; it’s how they killed Socrates. It can cause a minor irritation from touching it but not nearly as bad as poison oak. Poison oak commonly causes rashes and blisters. Great first post, Eric! I love that the whole family is getting involved! My husband is the opposite – he doesn’t really have any desire to do any writing, but loves taking photographs! I went to Redwood National Park as a teen, but this sounds like another great, I’m sure less-visited, option! And 20 miles of trails? Sounds perfect to me! Cheers! Wow it so amazes me how many state and national parks there are in California! My boyfriend and I visited the redwoods while camping in Big Sur earlier this year and I wish we had of been able to stay longer. What a beautiful spot! I love the redwoods — and I especially love finding less crowded parks. I haven’t been to Jedediah Smith since I was pretty young, but I’ve managed to get out to Armstrong since then. Saved for later! Welcome back to writing, Eric. I seriously want to explore more of the US’s parks when I’m home for a year, and this looks absolutely gorgeous (though that bit about the fog and watching out for predators– yikes!). Welcome to the blogging world Eric! I haven’t had the opportunity to visit the redwoods of Northern California (even though I have lived in California more than 10 years). I have seen the ones in Monterey and Santa Cruz counties and they are spectacular. However, I know those cannot be compared to the old growth forest of the north. Hope I can visit soon. Thanks for the warm welcome Ruth! Congrats on Eric’s first post! 🙂 I wish I could get my husband more excited about the writing parts of my travel blog, but he’s always happy to travel with me, so I take what I can get. I haven’t been to California in years, but we’re hoping to head out that way with our daughter really soon. This park looks AMAZING! I’m always excited to find places that draw in more locals like this one does. Pinning this for my future CA trip! Sounds like we’re in the same boat! Eric does love to write, but he just can’t narrow his focus enough to put something up on the blog – until now that is. He’s laid up for month recovering from an injury, so he’s been happy to help out. Thanks for pinning. Tara, great shots, great story and great writing! I’d love to visit there! But alas, I’m an East Coast girl! Maybe one day! Thanks, Mary. We’re east-coasters too, but the draw of the west is really strong in all of us! The Redwoods are so beautiful! I haven’t camped near them but my husband (an Eric too) and I drove down the coast and spent quite a bit of time there. The Ewoks are just about my favorite thing ever and I totally imagined myself zipping through the forest at high speeds next to them :). Fun post! Wonderful post! My family has done day trips through this area, but you saw some areas I haven’t explored yet! Such a beautiful + amazing place! I love the redwoods. Looks like you had a really fun trip. Gorgeous views! I’d want to camp out and stay forever. It looks like you guys had a lot of fun. Thanks for visiting, Leslie! It was a great trip, but really, we just love exploring new places together. That trip looks amazing. We totally love hiking in the mountains, walking through waterfalls and just being a part of nature. This is going to have to be on my bucket list. It was an awesome spot, which we discovered quite by accident.